The Ruin Sentinels are creations of the jailer. They have no corporeal form, and are only an empty soul that haunts the armor. 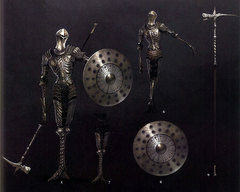 They are encountered in the Lost Bastille and Drangleic Castle, behind soul operated doors. The Ruin Sentinels in the Lost Bastille each have a name. They are called Yahim, Alessia and Ricce. The significance of these names is not known. Perhaps these Ruin Sentinels were the originals, and still retain some memory of their lives before the process that left them encased in armor. Interestingly, only the Ruin Sentinels in the Lost Bastille will throw their shields at you. This action may be a further indication that the Ruin Sentinels of the Lost Bastille have personality. 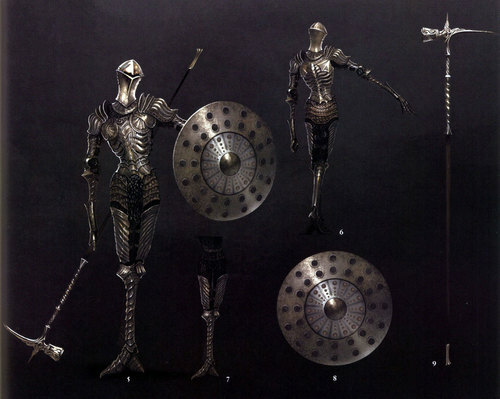 The purpose of the Ruin Sentinels appears to be similar to that of the Undead Jailer enemies. They are soldiers or guards whose job it is to stand and keep watch. Their position in the Lost Bastille indicates they were to keep prisoners from escaping (perhaps from the cells prior to their boss fog, or the section connected to Sinner’s Rise). Who the jailer is, is unconfirmed, but the face behind the title of “jailer” may have changed throughout the centuries. Originally the Lost Bastille has links to Olaphis and may have been built during that time. We know that the King of Olaphis began to seize anybody they found undesirable, cursed or no, and impound them in the Lost Bastille. Whoever posed even the slightest threat, was removed. This King may have created the Ruin Sentinels to watch over these prisoners and would therefore be considered the “jailer”. Vendrick then, in his travels, may have come upon the Ruin Sentinels and wished to recreate them for his own purposes. In a twist of fate, the Ruin Sentinels in Drangleic Castle appear to be the ones who are jailed and watched over by the Stone Soldiers. There are some interesting thematic coincidences to note about the Ruin Sentinels that may just be a result of being developed by a team. Their armor resembles Syan’s set in both colour and design (especially around the shoulders). Their helmets strongly resemble that of the Loyce Knights of Eleum Loyce and their maces resemble those of the Archdrake Sect.